APNU+AFC coalition’s press conference after the Cummingsburg Accord was signed on February 14, 2015. The Alliance For Change (AFC) wants a revised political pact with A Partnership for National Unity (APNU) before next year’s Valentine’s Day- February 14- the third anniversary of that agreement known as the Cummingsburg Accord. Following a meeting of its National Executive Committee (NEC) at the weekend, the AFC said it wants the revised accord to be put in place early in the same year that Local Government Elections (LGE) are due. “The NEC mandated the party’s leadership to formally write to A Partnership for National Unity (APNU) with regard to review and revision of the Cummingsburg Accord and stipulated that this process must be completed by the third anniversary of the signing of the Accord – February 14, 2018,” the AFC said. 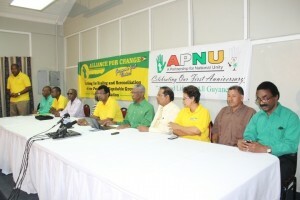 The AFC is not a part of APNU which includes the largest and most influential People’s National Congress Reform political party. Meanwhile, the AFC said it was still waiting on APNU to name its negotiating team. “The NEC has named members to the party’s negotiating team…in anticipation of APNU similarly name its negotiating team,” the AFC said. However, APNU sources have told Demerara Waves Online News that the APNU’s executive has not met since July, 2017. Sources told Demerara Waves Online News that Dr. Vincent Adams, who recently led an internal review of the Valentine’s Day 2015 Cummingsburg Accord, is heading the negotiating team. Also part of that group is former AFC General Secretary, David Patterson who party sources said have a lot of institutional memory. The AFC’s accelerated call for a revised political agreement with APNU comes just over one year before the next LGE are due to be held. At the last such polls held one year ago, AFC had raised concerns that APNU had out-numbered and dominated the local government lists of candidates. AFC sources said the party is likely to make a case for a 60-40 formula similar to that for general elections. Focusing on LGE, the AFC’s executive cited the need for the “party’s structures to prepare for the 2018 Local Government Elections and to improve the performance of the party’s secretariat with a view to enhancing its efficiency and effectiveness in serving both the party and the public. The NEC urged that the party heightens outreach activities across communities in Guyana and in Diaspora.